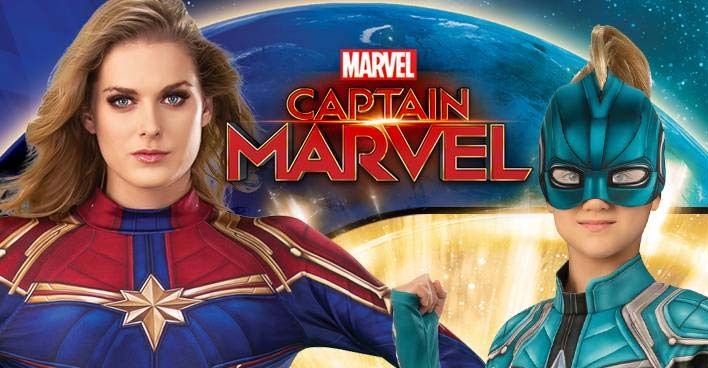 We’re still (a few) months away from Halloween, but the officially licensed Captain Marvel collection of costumes and accessories based on massive new Marvel adventure that is currently breaking records at the box office, is available online right now. You can view the Captain Marvel collection currently available from Spirit Halloween, and then click on any of the links or photos below to order yours now. Become the ultimate hero when you suit up in this officially licensed Captain Marvel costume! Featuring the style of Captain Marvel’s signature red, blue, and gold suit, this awesome jumpsuit will transform you into your favorite Marvel superhero in no time at all. Become the hero of Halloween night when you slip into this officially licensed Hero suit and represent Captain Marvel! The padded jumpsuit comes complete with extended sleeves and stirrups, a fabric belt and a headpiece for a completed look. Have your little hero feeling absolutely super when you help complete their costume with these officially licensed Captain Marvel gloves! These awesome gloves will have your young Captain Marvel ready for any adventure that comes their way! Show some love for the bad guys when you dress up in this officially licensed Kree Suit this Halloween! Coming complete with a detailed jumpsuit with extended sleeve and stirrup, the included fabric belt and headpiece will complete with comic book look instantly!